Aamir Khan is one of the actors who never shies away from experimenting his looks for his films. He ensures to make his reel life look absolutely real and that’s why he is known as the Mr. Perfectionist of Bollywood. Aamir who is known to pick up roles wisely, has zeroed down on another project for which he has undergone such a transformation and it is remarkable. But this time, it is not for a film. Then why is he associated as ‘Daddu’? Read further to know more. Aamir Khan's Lal Singh Chaddha, the Remake of Forrest Gump to Release In Diwali 2020? On the occasion of Holi 2019 which was yesterday (March 21), Aamir Khan teased his fans by sharing a video. It showed him transforming into an old man. In the video clip that he shared the hairstylists were seen making him wear a bald cap and later adding a wig, giving him a salt and pepper look, he was made to sport a soft silicone stomach belly and a pair of oldie glasses. Though he did not reveal about the project, a video later surface online which cleared all the doubts. Lal Singh Chaddha: All You Need to Know Tom Hanks' Forrest Gump That Inspired Aamir Khan's Upcoming Film. 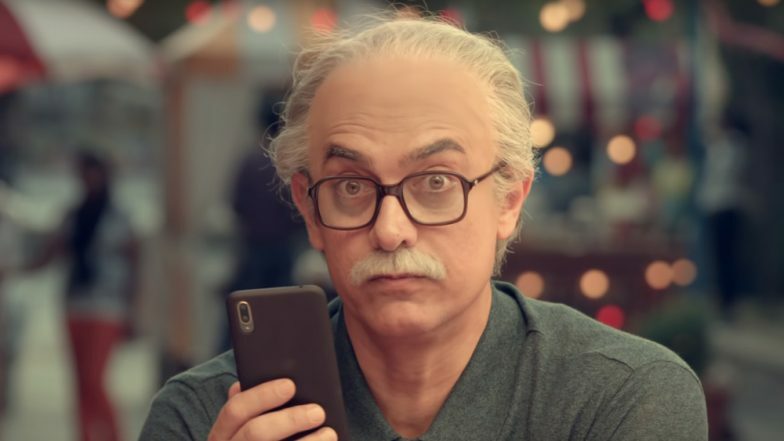 Yes, Aamir Khan has been roped in as the brand ambassador for PhonePe. This transformation is for an upcoming commercial in which he’ll be seen playing the role of a grandpa (Daddu). Meanwhile, Aamir has also announced about his next film, Lal Singh Chaddha, the remake of Tom Hanks’ film Forrest Gump. It is reported that the film is planned to hit the screens in Diwali 2020.